The SCI FI Channel is calling it quits with Stargate Atlantis — or at least in its current format — the network confirmed in a press release today. The spin-off series will conclude in January with the current, fifth season, and will be followed with a 2-hour Atlantis movie (story). Despite the cancellation, series creator Brad Wright tells GateWorld that, looking ahead, the Stargate franchise is as strong as it has ever been. SCI FI will have the exclusive worldwide television premiere of the movie, which MGM will subsequently release on DVD. The movie does not yet have a title. Joseph Mallozzi and Paul Mullie, executive producers and showrunners on Atlantis for its final two seasons, will pen the film. “We share in the producers’ enthusiasm to move forward in this direction and we look forward to a strong and continued relationship on Stargate Atlantis in this new format,” said Thomas Vitale, SCI FI’s Senior Vice President Programming & Original Movies. “Enemy At the Gate” will be the 100th and final episode of the series, and will air in January. Stargate Atlantis was SCI FI’s highest rated premiere ever when it debuted on July 16, 2004. The success of those two films not only helps the cast, crew, and fans of Atlantis see a light at the end of the cancellation tunnel, but has also begun to redefine what “cancelled” means. In the future, more television series may give way to direct-to-DVD movies, as a way of keeping the adventure going. “Rob and I have spent several years biting our finger nails over the prospect of renewal, but you’ve got to respect both MGM and SCI FI for giving us the opportunity to continue both Atlantis and SG-1 in a series of movies,” Wright told GateWorld. “This is nothing to complain about — it’s something to look forward to. The complete press release follows on page 2. 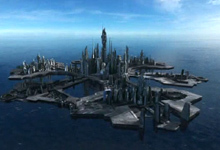 GateWorld will have more comments from the producers of Stargate Atlantis soon.